Creamy greek yogurt fruit dip makes you feel like you’re indulging in something decadent, when really you’re enjoying a healthy snack! Creamy, slightly sweet, and perfect for dunking your favorite fruit. 3 flavors: chocolate, key lime and almond butter. 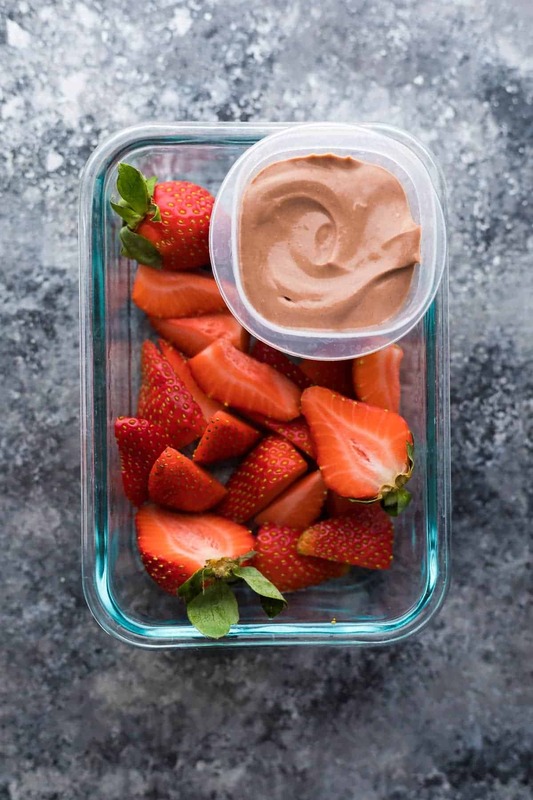 But when thinking of different sweet snack options for a work lunch, I thought this greek yogurt fruit dip would be a great way to keep calories low while still giving a little more pizzaz to your packed fruit. 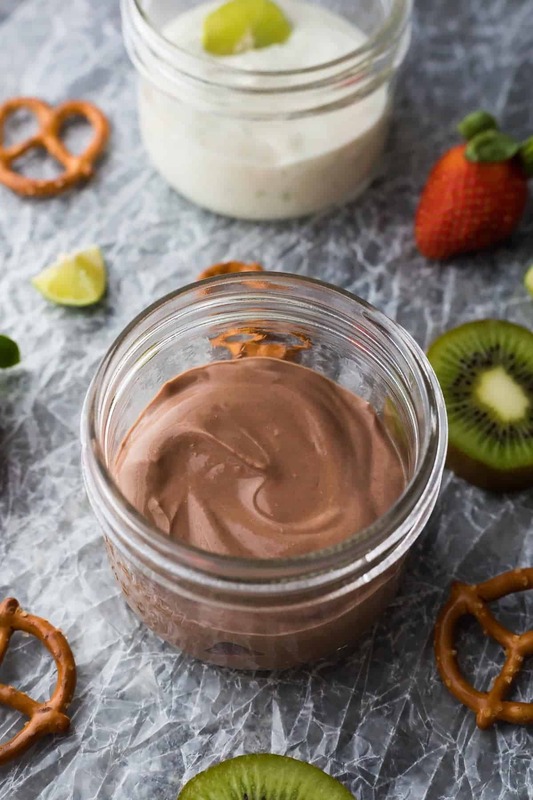 I couldn’t keep it at one fruit dip, so I ended up coming up with three greek yogurt fruit dip flavors: chocolate, key lime and almond butter! This is SUCH an easy recipe, you can have it ready in under 5 minutes! Simply stir together some plain yogurt (I use greek yogurt for a nice, thick fruit dip), with a bit of sweetener (honey or maple syrup work well), and some other flavorings (spices, cocoa powder, nut butters etc). How long does fruit dip last? These fruit dips will keep for quite a long time; likely as long as the expiry date on your yogurt. I prepare and portion out 4-5 days at a time for snacks through the week. When portioning these yogurt dips out, I worry more about the fruit expiring than the yogurt. prepare fruit for dipping up to 4 days ahead- you may want to do a vinegar wash on your berries to ensure they last as long as your yogurt dip! 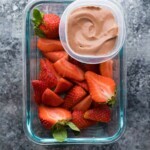 This chocolate greek yogurt fruit dip isn’t overly sweet, although you can adjust the sweetness by adding more honey. The sweetness comes completely from the fruit, and goes perfectly with the chocolatey, tangy greek yogurt fruit dip. 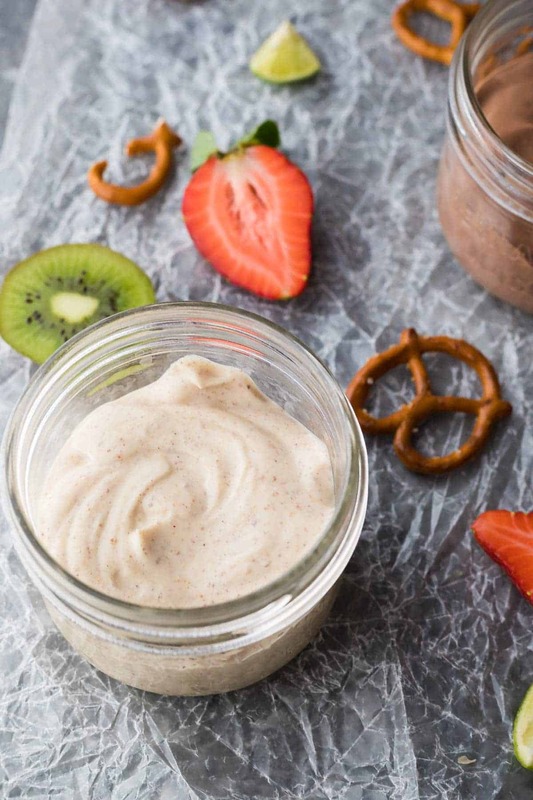 What do you serve with chocolate fruit dip? The second greek yogurt fruit dip flavor I came up with was key lime…I’m just such a key lime pie addict! 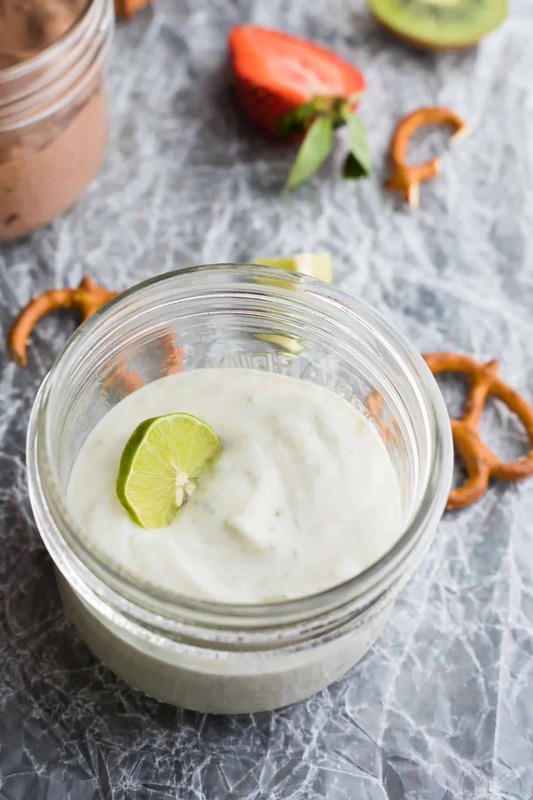 This key lime fruit dip is tangy and citrussy. The third fruit dip flavor is my favorite! I didn’t think I would love this almond butter greek yogurt dip as much as I do, but it’s great! The almond butter flavors are nice and mellow. What do you serve with almond butter fruit dip? Watch the video below to see exactly how I prepped my healthy fruit dip recipes. It’s so easy! You can find more of my recipe videos on my YouTube channel, or on Facebook. Looking for more snack recipes? Check out this round up with more than 36 Healthy Snacks! 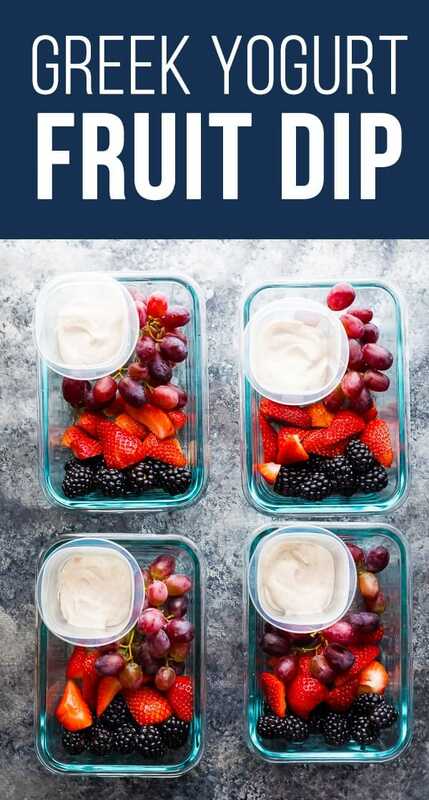 Healthy Greek Yogurt Fruit Dips are a delicious way to serve fruit, and also a great way to encourage you to eat more fruit. 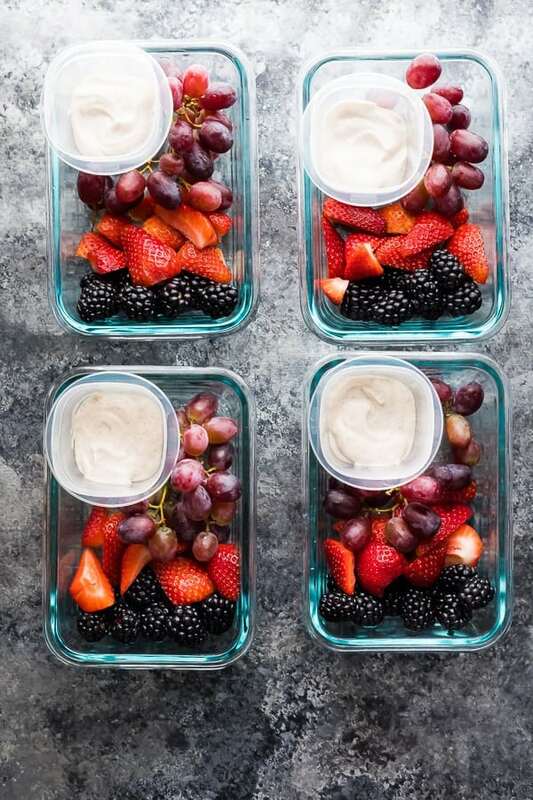 We love these yogurt dips as a meal prep snack. Divide into 3 tablespoon portions and serve with fruit. You know, I always ignore the fruit dips on those platters, too, but I think if I made my own like this one, I’d just be sitting on the couch scarfing the whole thing down!! Yum! I THINK THE KEY LIME IS MY FAVORITE! These are all such tasty options for fresh Spring fruit! Can’t mess with key lime! I can only get the chocolate dip recipe. How can I get the other two. These dips are truly mouth0watering, Denise! Can I use maple syrup instead of honey? I lean toward savory dips most of the time, but I love Greek yogurt dips to satisfy my sweet tooth! I love all these flavors and they’d make such great snacks!